According to the Centers for Disease Control, in 2012, nearly 5,000 pedestrians were killed in traffic accidents and 76,000 others were injured. Older adults and children are the most at risk for being killed or injured in traffic accidents as pedestrians. The CDC notes that roadways can also be dangerous places for cyclists. It notes that cyclists are at a higher risk of being injured or killed in a crash than drivers and motor vehicle passengers. With proper safety knowledge and extra vigilance among parents, caregivers, and drivers, pedestrians and cyclists can be much safer. Following is a resource guide on pedestrian and cyclist safety. Make eye contact with drivers. As this article notes, it is important for kids to learn to use traffic signals and to cross the street only at crosswalks. It is also important to teach them to make eye contact with drivers before crossing the street. They should also be on the lookout for vehicles that are turning or backing up. Pay attention. Of course, maintaining one's safety while walking means minimizing other distractions. As this article notes, it's important for kids to put down devices, toys or other distractions when they're walking. This is an especially important lesson for teens, as according to the CDC, they are more likely to be treated for crash-related injuries than any other age group. Cross in front of the school bus. In this list of safety rules, the National Center on Parent, Family, and Community Engagement stresses the importance of teaching kids the proper way to cross the street after getting off the bus. First, wait until the driver says it's safe. Then, cross in front of the bus. The driver cannot see kids crossing behind the bus. The “Safe Routes to School Guide” from the National Center for Safe Routes to School offers additional safety skills for children and resources for parents, including lessons for tweens and teens. Know what street signs and traffic lights mean. The Wisconsin Department of Transportation stresses the importance of kids learning what street signs mean and how to follow them. It offers this street signs memory game to make learning about street signs more fun. Also, Safecar.gov helps parents clear up myths about what kids might believe about traffic lights. Always walk. Don't run. This checklist of rules for kids and their parents stresses the importance of walking, not running, when crossing streets. It also advises parents to teach their kids that they should never run into the street to retrieve a pet, toy, or ball, and that kids should never play in the street. Instead, they should stick to yards, parks, and playgrounds. According to statistics from Loyola University Health System, senior citizens make up 13 percent of the population, but account for 23 percent of all pedestrian fatalities. 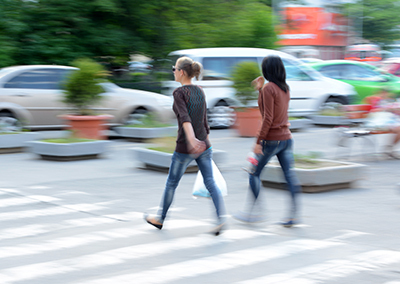 Following are pedestrian safety tips specifically for older adults. Look for reverse lights. In its “Safe Walking Tips for Seniors,” Los Angeles County's Department of Public Works stresses the importance of awareness for walking seniors. Especially, in parking lots and around alleys and driveways, seniors should look for reverse lights before crossing behind a car. Wear sturdy shoes. As these safety tips from the City of Chicago point out, strong footwear is important. Falling on a sidewalk or in the street can be very dangerous. These tips note that shoes with side-to-side support will give seniors the stability needed to keep proper footing. Walk wisely. The New York City Department of Transportation offers this checklist for seniors. It provides them with a quick and easy way to make sure they know what the weather will be on their walk; they have everything they need (glasses, hearing aid, etc. ); they're wearing proper clothing (bright, reflective); and it reminds them to consider calling a walking buddy. Look before stepping into the road even when a light turns green or the walk sign appears. Let vehicles pass that may not have enough time to stop for you. Don't cross when the “Don't Walk” signal is already flashing. If it begins flashing while you're crossing, continue to cross. Use sidewalks. These “Safety Tips for Elderly Pedestrians” from the New York City Police Department stress that older adults should use sidewalks whenever possible. It advises that if they have to walk in the street they should do so facing traffic. Learn a familiar route. This article advises elderly pedestrians to use the same route as much as possible so that they can familiarize themselves with possible obstacles and problem areas, such as low curbs. And even if the route is familiar, the article notes elderly pedestrians should always use canes and other walking aids if they are needed. Don't assume drivers will stop. As this article notes, drivers are often distracted (e.g. a driver may be on their cell phone) and are not paying as much attention to pedestrians as they should be. Don't assume that a driver will see you and stop for you. Make eye contact with the driver. Ride with traffic. The NYC DOT provides a list of rules and safety tips for cyclists in the city. One of those tips is for cyclists to always ride with traffic, not against it. And as these tips note, cyclists are responsible for obeying all road signs and traffic lights as well. Watch out for car doors. Car doors opening unexpectedly can be very dangerous for cyclists. That's why these safety tips for cyclists stress that when passing a parked car cyclists should ride a car door's width away from the it. It offers an illustration to drive home the point. Don't wear headphones. In its “Share the Road” tips series, the Washington D.C. Metropolitan Police Department offers several valuable tips for cyclists. For example, cyclists need to be able to hear the traffic around them so they shouldn't wear headphones while cycling. Do wear a helmet. In its safety tips for bicyclists and motorists, the California Department of Motor Vehicles stresses the importance of wearing a helmet to protect against head injuries. It provides an image showing the proper way to wear a bike helmet. Learn the proper hand signals. An important aspect of safe cycling is knowing the proper hand signals. This article and accompanying photos explain hand signals to use when riding a bike. Play defense. These “Safety Tips for Cyclists” from YieldtoLife.org stress the importance of always being aware of ones surroundings. Things such as snow slush, sewer grates, and potholes can be especially dangerous for cyclists. Always be on the lookout for possible problems. Yield to pedestrians and cyclists. The State of Michigan provides tons of great pedestrian and bicycle tips for drivers. For example, drivers should always yield to pedestrians, including when the driver is turning left on green. Be especially cautious at crosswalks. This list of tips for drivers from the University of North Carolina's Highway Safety Research Center provides advice for drivers on how to properly and safely go through or approach crosswalks (including unmarked crosswalks). It cautions that drivers should go slowly, be prepared to stop, and refrain from trying to pass or go around vehicles that have stopped for pedestrians. Pay attention in parking lots. As this article notes based on data from the Insurance Institute for Highway Safety, more than half (52 percent) of all back-over injuries happen in parking lots. Though most don't consider it, parking lots are high-risk areas due to the number of cars and pedestrians and an overall lack of rules and regulations. Use extra caution. Eliminate distractions. Don't be a distracted driver. This handout stresses the importance of keeping your hands on the wheel and eyes on the road. It also advises that you not allow other passengers to distract you and don't try to do other activities, such as eating, putting on make up, or talking/texting on a cell phone while driving. Be especially cautious in bad weather. These “Practices for Drivers” tips ask drivers to be extra careful when driving in bad weather and at night when driver and pedestrian visibility is limited. In these conditions, it's more difficult to see pedestrians, and in the case of bad weather, pedestrians may not follow safety rules like they should. Follow the speed limit. According to the “Everyone is a Pedestrian!” Safety Tips guide, one of the best ways drivers can avoid accidents with pedestrians is to obey all posted speed limits. The guide notes that drivers should be especially strict about following the speed limit when in neighborhoods and school zones.